I woke up this morning to a dream about someone making me an artisan poptart (this has got to be a real thing in some hipster neighborhood, right?) I believe this was my brain’s way of saying: “hey human, if you’re not going to give me sleep, give me sugar. stat” (I suspect this was also primed by the donut/coffee article that somehow kept topping my sfn twitter feed yesterday). This is side of conferencing we don’t always talk about: accumulated sleep deprivation. When feeding off the high of the neuroscientific geniuses around you, it’s easily masked; but eventually the body catches up and you end up making word art instead of writing that article you really wanted to write. Or maybe that’s just me. SFN provides the same set of activities to partake in every day, but the permutations are endless. Saturday was full of back to back sessions and lectures, and Sunday was a full morning of symposium talks and an afternoon of poster visits. Today (Monday) was an entirely different beast. Same sfn, different story. Each day. I put our lab’s posters up today at 7:50am, in an eerily quiet poster hall. Within the first hour, the scientists began trickling in and before I knew it, I was on my 234th run-through of my spiel, answering questions and getting some really good feedback on the data. As exhausted as I was, this was really energizing. Bouncing ideas off other scientists (with a wide range of expertise) helped me think more critically about the data, come up with some new ideas and even getting more excited about my own work. The thing is, what I presented at this year’s sfn is actually a side project or in even more sobering terms, what I’ve at times considered “my backup project” for the past year or so. The findings were humble, descriptive and incremental – but it’s data. These are some of the realities you face as a graduate student: balancing the number of years that have gone by, the amount of time and energy you’ve invested in other failed projects, and setting your sights on following through on “incremental” findings – which remains open to interpretation (and yet, this aspect is what led to some really interesting conversation with other scientists). I learned to cultivate an appreciation for what the data in front of me could be suggesting. When all was said and done, I was full of adrenaline, hope and ideas – all of which I threw in my PI’s direction. We bounced some more ideas off each other and extended the conversations over coffee and donuts (I got one!) … and the rest remains to be extended when I return to Davis. I spent the rest of the afternoon thinking about my project, catching up with old friends, colleagues and mentors (scientists and non-scientists alike) … and napping. 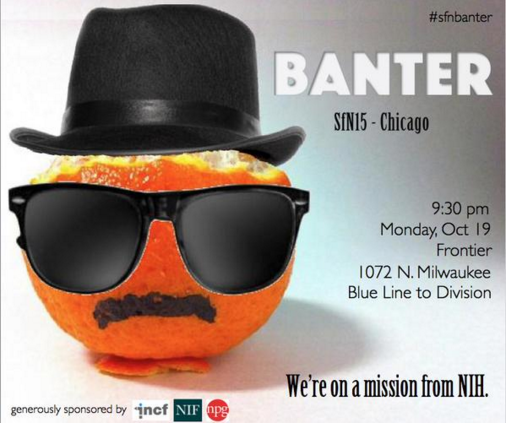 Now my friends, it’s time for SFN Banter. Tomorrow, I’m sure, will be same sfn, different story.